When Chef Babak Fami told his wife Shabnam Moier he wanted his own restaurant, she listened and supported him. What type of restaurant? Even though he worked at Terroni, Chef Fami had no desire to cook Italian. Instead, he wanted an inclusive menu where numerous cultures were represented and to share the diversity through a sandwich. Eighteen months later, FAMO (a combination of Fami and Moier’s surnames) finally greets Queen East. I know what you’re thinking … sandwiches? What’s special about that? FAMO stays away from the overdone BLT and cold cuts. Instead, you’ll find ingredients like beef cheeks, lamb and tongue. Moreover, each incorporates spices, herbs or ingredients from different cultures so they’re global sandwiches. Oh my! In tribute to our city, the Six ($13) takes beef tongue and braises it in red wine for hours until it becomes a flavourful piece of meat. For those who haven’t tried this part of the cow before, when prepared correctly, it’s like eating beef tenderloin. 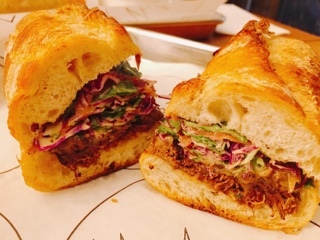 After thinly slicing the tongue, it’s topped with truffle mayo, arugula slaw and red onions. Overall, a delicious combination of flavours – the truffle essence is evident but not the first thing you taste. However, the tongue does get lost between all the ingredients and thick bread. Perhaps a different bun or more meat would help. The Cheek and Bun ($13) consists of slow braised beef cheek and caramelized onion – already a good start in my books – then adds arugula slaw for a bit of crunch and freshness. Of course, the beef is succulent and tender and this one of the more flavourful sandwiches I tried. Since the East Ender ($12) uses chicken breast for the base, the meat is drier than what you’d expect from pulled chicken, but is lighter tasting and seems healthy. 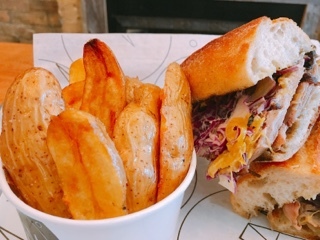 I love the spicy mango slaw that tops the creation, which adds a tropical twist and interest to this safer sandwich. If their vinegary hot sauce is available that day, be sure to grab plenty as it goes great with the chicken. Although they’re all good, my favourite is the Famous Lamb ($13), which pays homage to the owners’ Persian heritage. 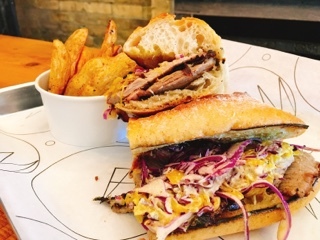 In between the crusty toasted baguette are thick slices of slow roasted lamb leg rubbed in earthy spices such as cloves. 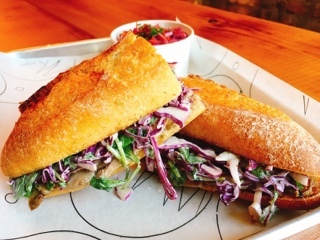 Topped with a fragrant turmeric onion slaw this is a tasty sandwich. It goes even better with some of FAMO’s house made green chili hot sauce, just use it sparingly … it’s powerful. Chef Fami tries to keep the sides that come with their sandwiches healthy with a variety of slaws (beet, fennel or green apple). Even the FAMO fries won’t leave you feeling guilty since they’re blanched and only fried once, instead of the multiple dips that competitors often rely on. Despite only one kiss with the hot oil, the wedges are crispy. Made with huge wedges of fingerling potatoes, these fries are hearty and will leave you full. 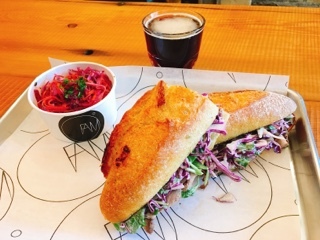 Drinks are affordable with $5 red or white wine that’s chosen to complement their sandwiches. 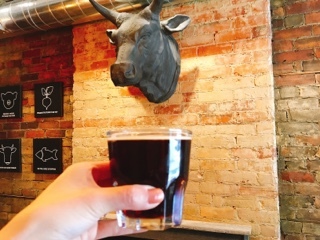 For a non-alcoholic alternative, try the Station cold brew coffee ($4.50), which steeps the ground coffee in water for 18 hours so there’s no risk of scalding the beans. The coffee is so mellow, but still flavourful, I drank it black. 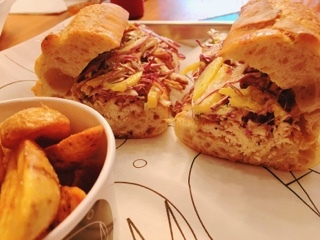 Even though sandwiches are made-to-order, they’re finished quickly so it makes for a quick lunch. Additionally, FAMO’s dining area has long communal tables so you can sit and eat if you’re not taking out. 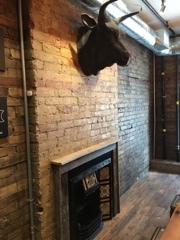 Plus, you'll get to check out the heritage fireplace that the owners preserved when restoring the building. Shabnam is pleased with the great feedback they’re receiving from the neighbourhood. She notes they’re sticking with the seven sandwiches and burger for now. But, every week there’s also a special creation and depending on its popularity, may become part of the permanent fixture. Moreover, office lunches may soon get tastier as FAMO expects to start catering later in December. Goodbye cold cuts, hello tongue and cheeks!